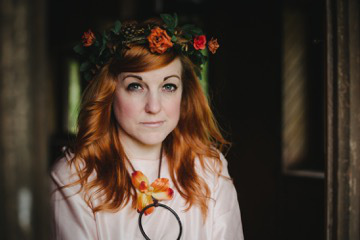 Elfin Bow is very much the ringmaster in this positively creative and interesting debut that takes the best elements of her musical inspirations and fuses them with the mysteries and wonders of folk music. Elizabeth Anne Jones aka Elfin Bow has arrived. Wherever she has been waiting, she comes from with a musical sound from parts of the 70s I see and hear when I consider a decade I was not a present in. I think of the joy, love and colourful air filled with the scent of sweet flowers; Bow’s debut has this kind of energy and intention. 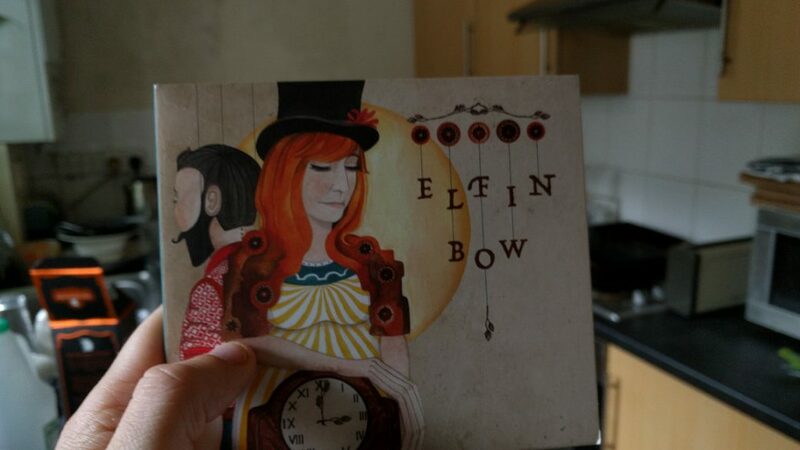 It can be seen from the get-go with Bow’s characterful album cover art which she has creating, and on it herself as a larger than life character. The instant impression is something rather Lewis Carroll-ish from the portrait on the cover pointing to a surreal content inside, especially with the clock motif. While I wouldn’t strictly categorise the album as “surreal”, it it anything but drab and the artwork is quite lovely. This is not to say that Bow’s debut album is all blue lagoons and influences from the age of flares, for there is a depth of thought to be found running through; quite a fresh and original one really. Indeed these waters harbour a shark or two inside the lyrical structures, and persistent instrument arrangement, Gary Edward Jones’ production and Gary Lloyd’s mix makes some excellent choices throughout. 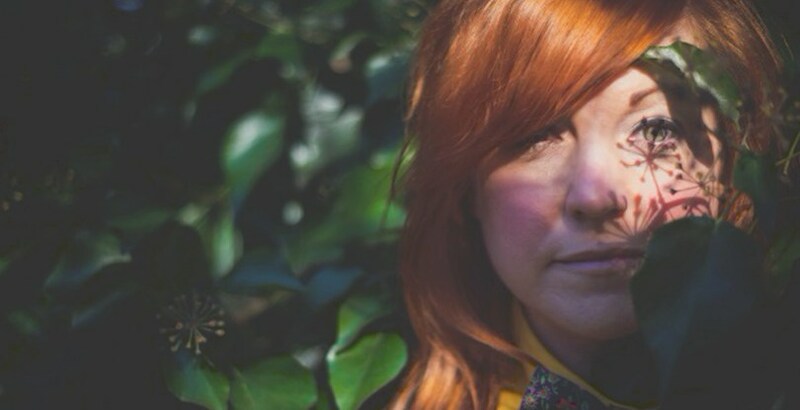 Rather than going straight for the jugular of folk convention, it walks the tightrope that is between accessibility and deep folk themes; there is a lot to like on both counts. It is not full on psychedelia, but the songs within have a flourishing of consciousness and bright shades, it romps through with the content with a giving it a confident, contemporary edge. Her particular sound might be due to how she describes as a “strict upbringing” in regards to the music she was allowed to listen to. It was only more recently she managed to hear and be influenced by PJ Harvey, Tori Amos, and Bjork. The kind of spectacle and slightly flamboyant character building she has taken on herself in the album does remind of the flame haired pianist herself with the direct, self-believing songs on the disc. In fact, at times there are passing nods to Fiona Apple also. Yes, it is indeed. 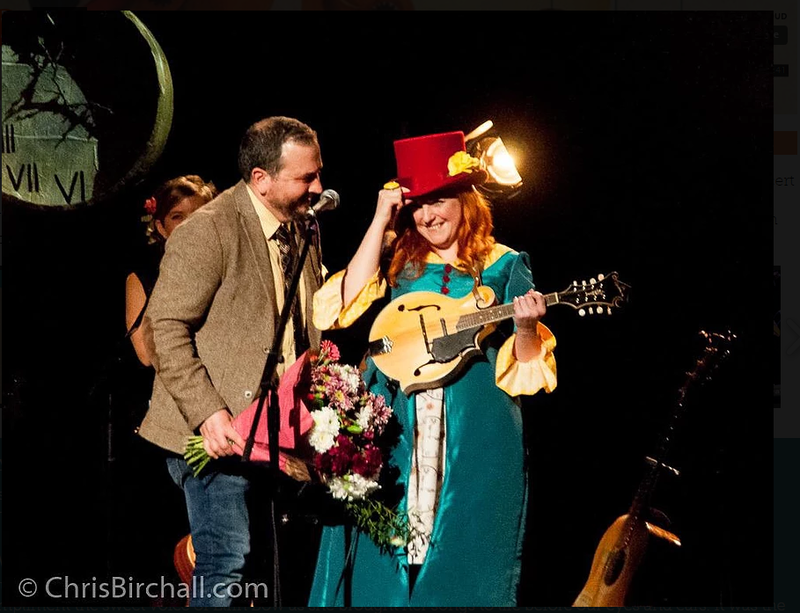 There are many elements of the folk tradition brought in, be it the seasonal “First Red Leaf of Autumn” or “Daffadilly Down”, the menace of “Grimshaw and the Fingerclaw” and “Holler in the Hollows,” or the banjo-love on “Prarie Madness.” It is just not all one thing and one thing only, there are singer-songwriter elements to the presentation but if you are a person who holds your genre dear in a singular way there isn’t much to fear by getting this. The reason is that this is not an album of piano cabaret or post-ironic, experimental work, these styles couldn’t be further from Bow’s consideration. 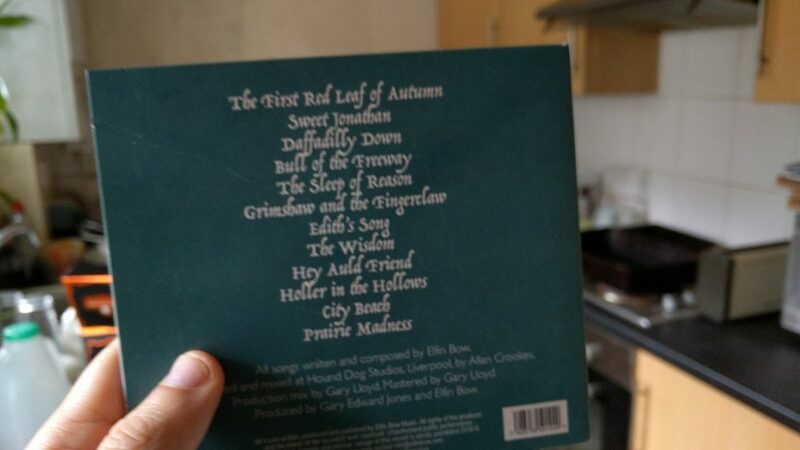 Instead it seasons folk music and folk music topics with these influences like mozzarella on your restaurant pizza; the album ends up partly straddling magic and folklore, and also a celebration of the natural world. For example, “The First Red Leaf of Autumn“ opens within the context of a relationship with reference to the seasons. Bow almost seems like the subject of the song here. She writes with a keen eye, rather than falling into the musical rut of being surprised about how people and feeling changes she sings with an enthusiasm for change and opportunity (mirroring her enthusiasm for this debut maybe?). Optimistic and indicative of an artist drawing inspiration, it is a nice opener, a subtle and enigmatic note to start. “Grimshaw and the Fingerclaw” with it’s darker bass (Oscar South) running alongside a slightly nautical pacing and shanty structuring is an exceptional addition. The mandolin and percussion gives it a rather adventurous feel. It casts images of shady brothels, misdeeds, dark stout and Chinese dragons as it paints a picture of urban shadow and inviting further examination. Spending much time showcasing the fantastic cymbal crashing, weaving soundscape and evocative flute (Victoria Wasley) as it does; credit should also be given for the wonder-baiting and silken voice of the lead. The quality of the mixing with the vocal harmonies is superb, it might take you a while to fully grasp it’s intricacies as you follow the strong melody but there is so much fun to be had listening carefully and making sense of this number. It is like a flint sparking the mind, and the sparks are the wonder spraying outward. “Edith’s Song” follows the previous track (it directly references the characters) but takes things out of the urban and into a kind of monologue being sung by the central witch character. It is one of the best songs on the album, not just because I am a fan of witch songs. It starts off with a kind of ambience that could go a number of ways, like a nameless spell it isn’t obvious at first how the song will take shape. The guitars tease that it could be more of a blues track or a gloomy instrumental; throughout there is a low hum that waits like an owl about to dive for prey. It then moves from a stirring introduction; the drums beat a sweet beat (Daniel Logan) and the wind blows (Saydyko Fedorova) as it takes flight. Bow’s voice once again reaches out and this track is a fine example of the observations about nature she makes on her debut work as she ropes in this imagery. 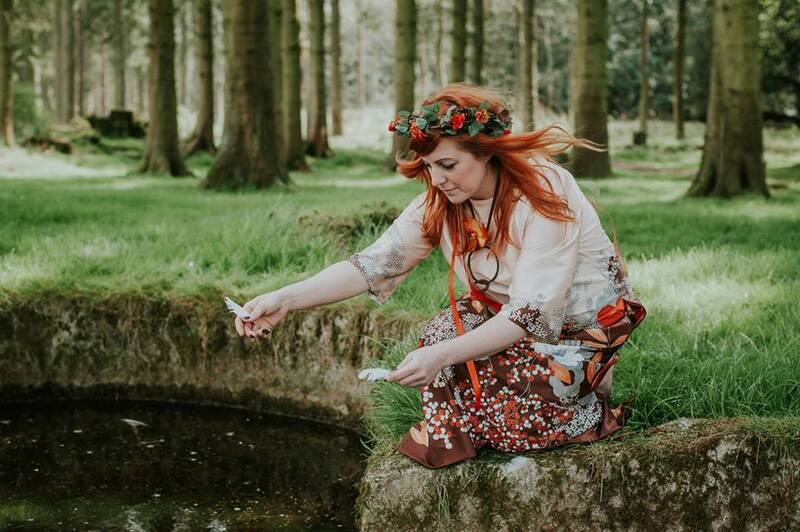 Truly a gem of nature folk with it’s lyrics, “call me a flower on the water with pebbles that float in the rain” it is a heady mix of mystical vocals with a penetrating quality like an Arctic Wind. Mention must be made for the final track for “Prairie Madness” is just a joy to behold. Whatever you read into the mixed light/darkness, introspective/moral parts of the album, there is little ambiguity in its closing call with old time number about waiting for a father to return, “his cart is green and yellow and his horse is mottled grey.” There is reference to clapping, there is clapping and banjo (Jamie Francis) makes an appearance cheering as the song bounces along. One might remark that the song doesn’t really fit but it goes out on a high note, and if ever there was a song that stirs memories of Charles Ingles (Michael Langdon), then this does it. Very jolly, worth a listen. Spoilt for choice on an agile album that seems like a project borne from a hard-earned happy place, it is a very good debut indeed. I say this with compliment as often people consider that misery and depression are your best bedfellows when writing music, this is proof that this is not always the case. You can almost hear the snapping of jungle vines as Bow escapes the uncreative clutches of teaching and throws herself at any musical resistance like hot knife through butter. Having brought the best sensibilities of her musical inspirations and the positive, engaging vibe of earlier decades we see demonstration of her energy is like a serpent, quite playful, dark in places and full of conviction. It is with great pleasure I recommend Elfin Bow’s debut. Thank you so much for this great review of my album. I always find it fascinating how different people engage with the imagery, intentions and musicality of my work. I really appreciate you taking the time to write deeply and creatively and for recommending my creation to others.